Check Out What's Going on at MOSI Now! Check Out What&apos;s Going on at MOSI Now! Hey Tampa Bay, Alex here to let you know what is happening now at MOSI. 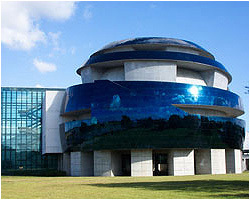 Teachers in the state of Florida get FREE GENERAL ADMISSION with a sch ool ID or other proof of employment. Family members of teachers also receive an additional $5 off! May not be combined with other offers or discounts. Excludes special engagement exhibitions, films, events and ropes course. $5 discount is good for up to six (6) family members. (Save 10% at MOSI’s Elements Gift Shop on personal purchases or purchases for your classroom when you present a school ID or other proof of employment. Hurry, because the offers expire August 26, 2011!! Design Zone is at MOSI this summer. In Design Zone, you can go behind the scenes and see how videogame developers, music producers, roller coaster designers and other creative problem solvers use math and science to do the amazing things they do. For more information on this offer or exhibit, visit www.mosi.org or call 813-987-6000. Have a wonderful day and check back with us often for information on Tampa Florida Attractions!